Bremen Cathedral (German: Bremer Dom or St. Petri Dom zu Bremen), dedicated to St. Peter, is a church situated in the market square in the center of Bremen, in northern Germany. The cathedral belongs to the Bremian Evangelical Church, a member of the Protestant umbrella organisation named Evangelical Church in Germany. 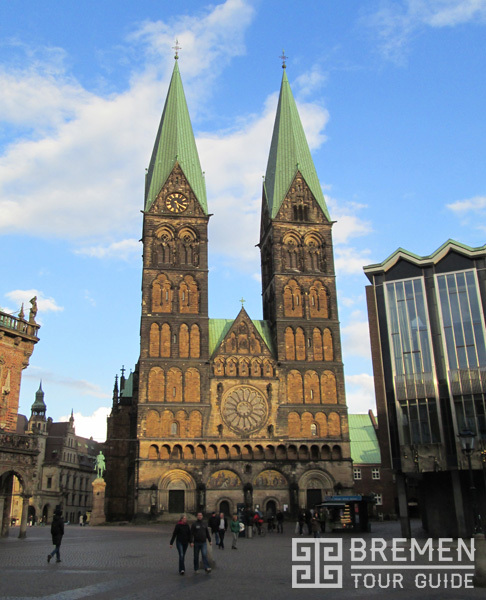 It is the proto-cathedral of the former Prince-Archbishopric of Bremen. Since 1973, it is protected by the monument protection act. An unusual “Bleikeller” or lead basement is located beneath the nave, which even before the Reformation had a reputation as an excellent place to preserve bodies of the dead in amazing form. Eight mummies in glass-topped coffins can be seen there. The displays lists among those on display: two Swedish officers from the Thirty Years’ War, an English countess, a murdered student, and a local pauper. The crypt has become the cathedral’s most visited attraction for more than 300 years. The Dom Cathedral is included in our English Marktplatz and Dom Tour. 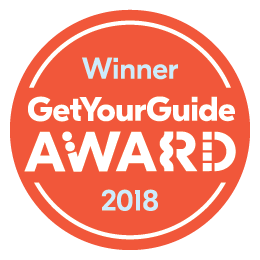 You can book your tour here on our website. 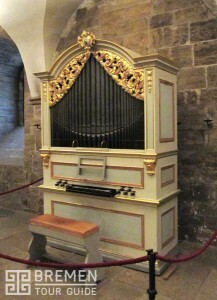 Bremen has a long-standing tradition of fine organ music since 1526. From 1698 to 1843 the famous organ built by Arp Schnitger, one of the Baroque period’s best known organ makers was the main organ. Its replacements, the Schulze organ and then the Wilhelm Sauer organ, one of the largest in northwest Germany. The cathedral today has five organs in different parts of the cathedral and continues the long tradition of great organs and organists. The cathedral has twin 99 meter towers referred to as the north tower and the south tower. The towers were constructed flanking the main entrance portal on the west front of the church between 1215 and 1253. In 1346 the towers were strengthened and given pyramidal tops of uneven heights. When the towers were restored and raised in the 1890s they were given Rhenish “helmets,” which still cap the towers today. It is possible to climb the south tower for a view of the city. The north tower remains closed. The crossing tower is a reminder of the original style of the west front towers with a pyramidal cap. Opening hours: Monday – Friday 10am – 4:45 pm. Saturday 10am – 1:30pm and Sunday 2pm – 4:45pm.